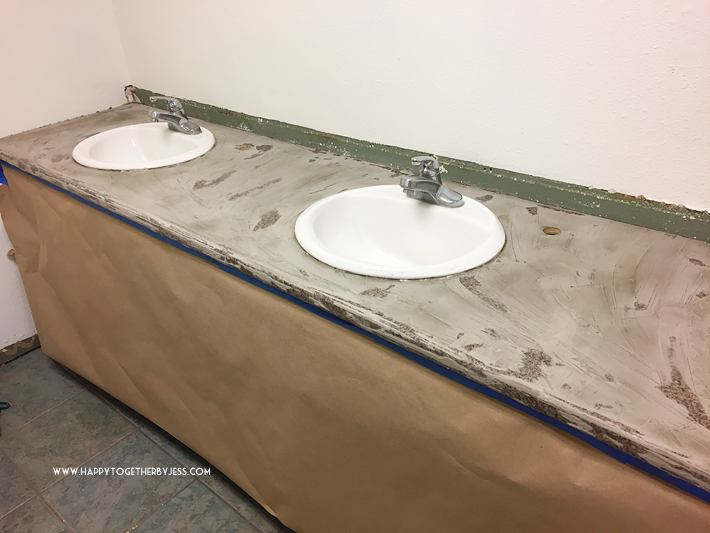 A Beautiful Mess: Concrete Countertop DIY and Concrete Feather Finish Countertop (their first post was my biggest inspiration because that one had curved edges like the one I was working on! They look like they did a much better job than I did though hahahaha). 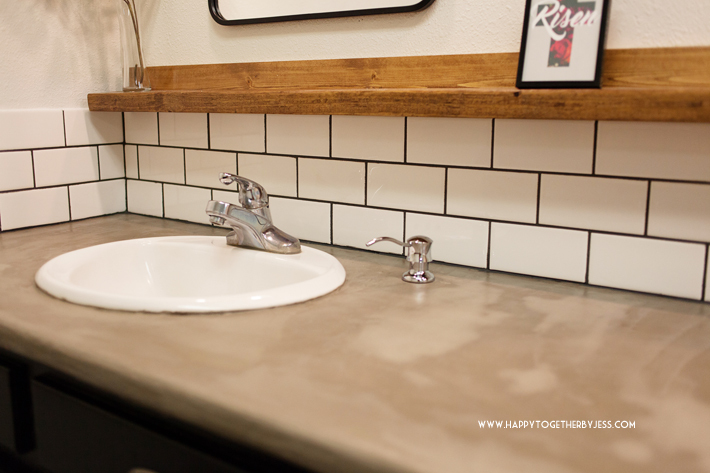 First off, let me begin sharing about these countertops. They are laminate but have a curved front edge. Many of the tutorials online appear to have all straight edges. Now some of the sides were straight and I have to say that this process works best on straight edges. I sanded the laminate some to help with adhesion, but it was still a battle to create a quality look and thickness on those curved edges. So, if yours are curved, be aware of this. You will want to take some extra time on the curves and I ended up just using my hands (which had a fitted latex glove on to protect my hand) to apply it there. The straight edge tools people suggest using just didn’t work very well for those spots for me. Secondly, since these are countertops in a bathroom, I was not worried about making it food safe since no food should be in the bathroom hahaha. That made the process even less expensive and faster to accomplish. So I would recommend this type of diy project very quickly for a non food space and be more hesitant to for a kitchen type space. The products I ended up using were all from Lowe’s: TEC Skill Set Indoor Skimcoat and Floor Patch and Quikrete Cure and Seal (which, again, I used since this wasn’t a food surface). 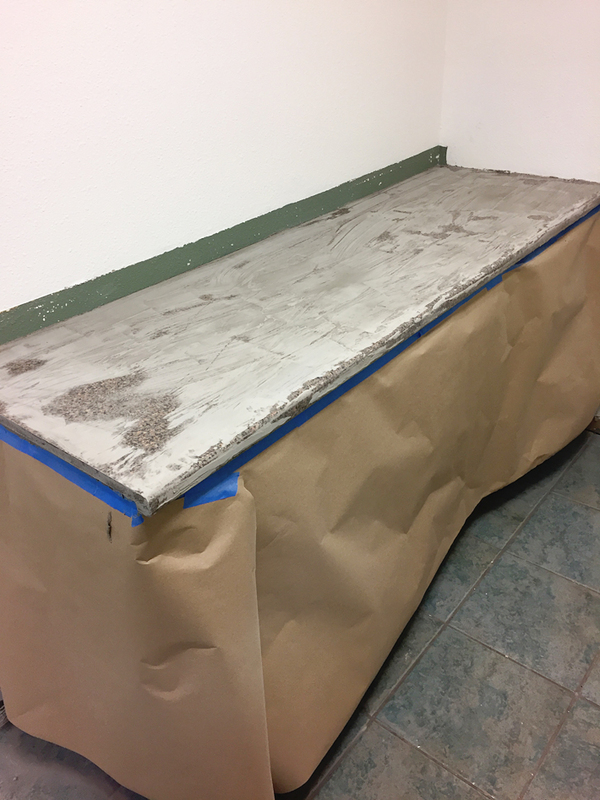 I first began by sanding the countertops to help create a surface that the skim coat will adhere to nicely. I just sanded by hand for this versus using a sander. Then I cleaned and taped up some paper to protect the cabinets. I mixed up a small amount of skim coat at a time until it was the consistency of peanut butter as I had read. After doing this a lot, I found that I liked it actually a little wetter than that consistency. It made it easier to apply and still dried very well and rock hard. The skim coat dries on the fast side, so that is why smaller batches is a good idea. The first coat was the hardest to do for me. It was very rough and didn’t fully cover which I expected from the other posts I read. I saw how many people would use their sander at this point and in between each coat to smooth it down, so I did that at this point. I totally regret doing that! The dust it created was unreal. Covered everything. Even created a layer of dust on the walls that I had to wash off. What I discovered is that I preferred to lightly sand in between each coat to get any “sharper” spot smooth, but the next layer I applied would fill in the crevices and such well, smoothing it out on its own. I also used a flat metal and plastic scraper to see which one I liked best. They were both okay, but it was good to have a larger and then smaller one to go around the edges of the sink and close to the walls. Another thing, which I mentioned earlier, was that I also really liked the result of using my (gloved) hand to spread on the skim coat for the layers after the first one. I could feel the surface and level out some spots nicely and it was easier doing that on the rounded edges. If you use gloves, make sure you have a few pairs as you will need new ones for each coat. 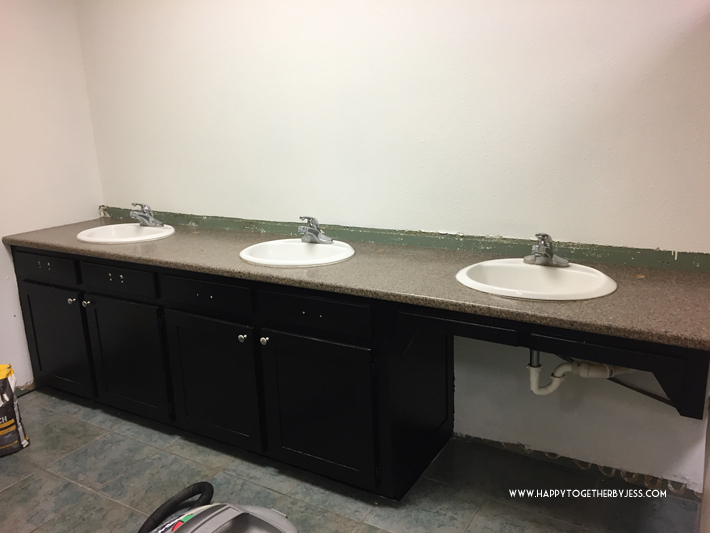 All in all, I did three coats on each countertop. I will be honest though, I probably could have done one more coat on the rounded edges. But, I was out of skim coat and didn’t want to buy a huge bag just to do that. Plus it still looked great anyways! After it was really really dry, I did two layers of the concrete sealer. It changed the color only slightly. The first layer didn’t make a big difference, but the second coat gave it more of a sheen (which I thought looked really nice). 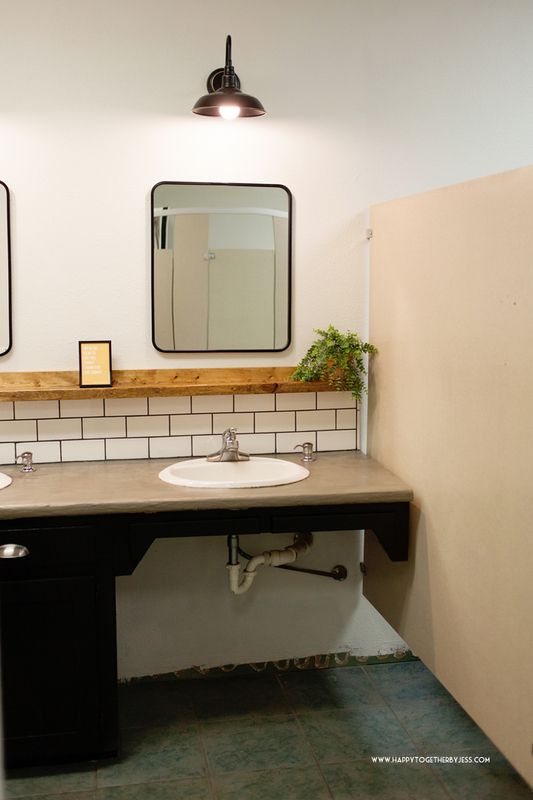 After the bathrooms began to be heavily used again, the water and soap did create darker spots. I thought it looked really awesome and added character, although others might not like that. The sealer seemed to be good, but I suggested that they later add a layer of polycrylic for even better protection and waterproofness. Or at least another layer of this sealer. I had read some others who had used polycrylic and had great results. Even though I didn’t technically use it yet on skim coat, I have used it on so many other materials (wood, paint, ceramic, etc) that I do not doubt its abilities to do a good job in this circumstance. 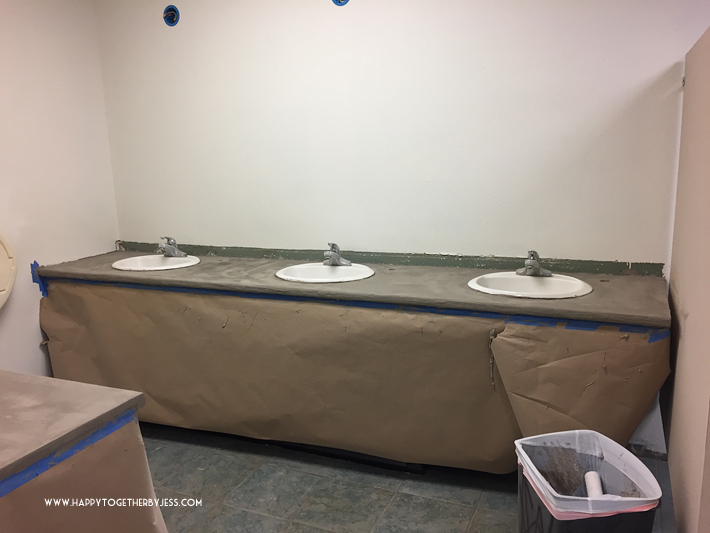 All in all, such an easy (but slightly time consuming since you have to wait on drying times after every layer of skim coat and sealer you do) and cost effective way to update countertops. Maybe one day I will end up doing it again. 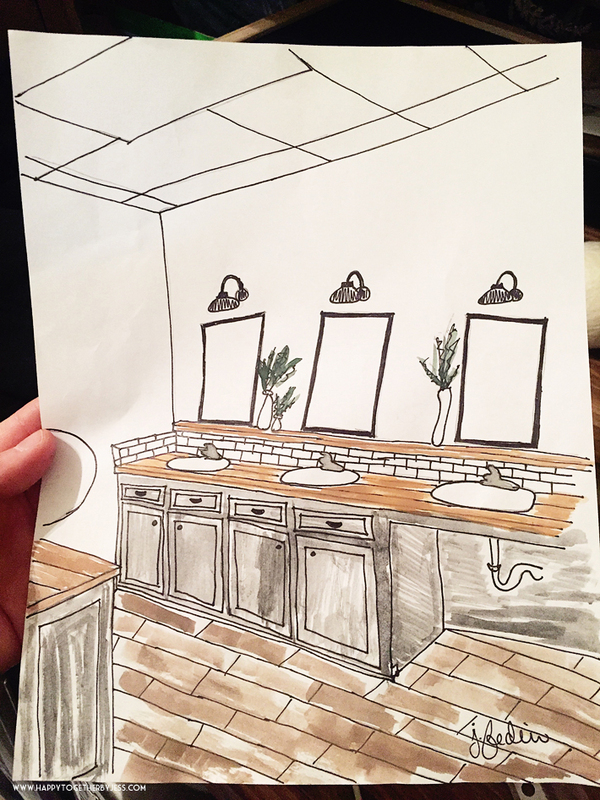 I have been working really hard lately to finish up some projects I had committed to and this simple bathroom makeover is getting so close to being done! 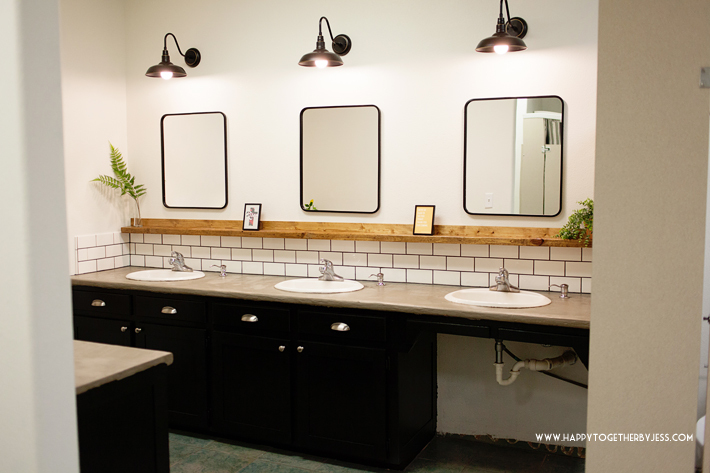 And yes, I’m calling this a simple bathroom makeover because most everything was kept and it was done by me, a regular diy’er, and others with little experience in this type of thing. The last few things left (new flooring/baseboards) are things that are out of my capabilities on such a large level so those are being hired out. But I’m extremely proud of what has been accomplished so far and thankful for all the help I have had during this process. 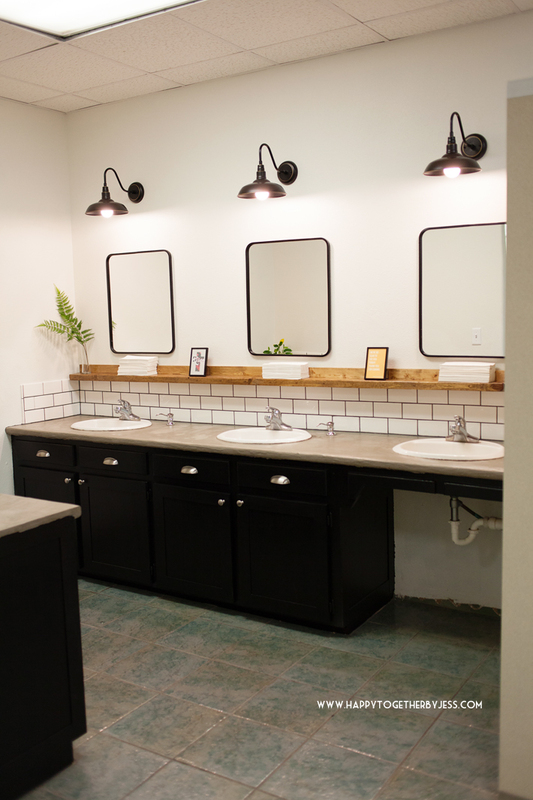 This makeover has happened in two bathrooms at my church and is almost done in another two, but I’m focusing on this one for sharing purposes. 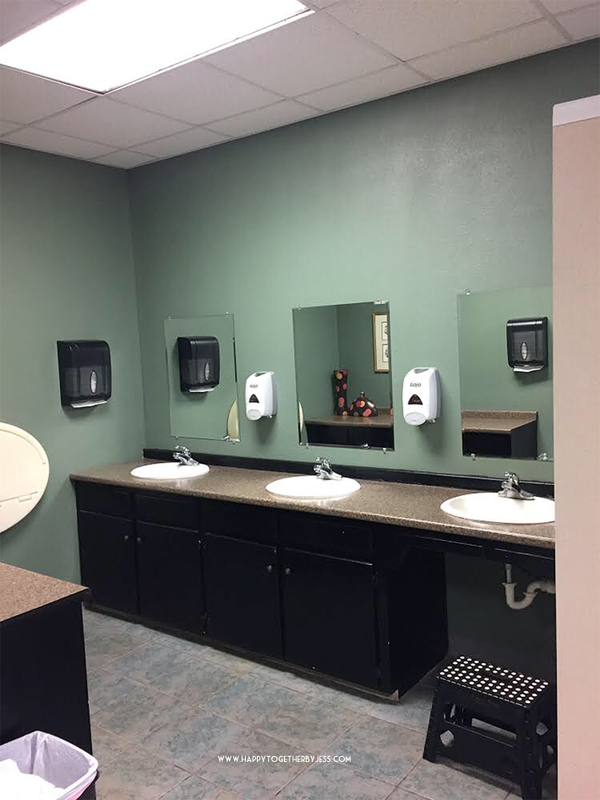 They all are the same colors and style, but the women’s bathroom is more pleasant for pictures 😉 I seriously can’t believe how different it looks with just a few changes! 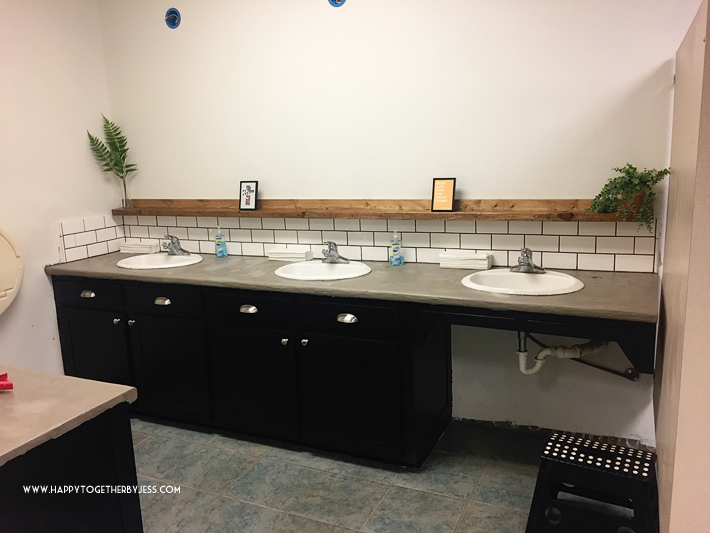 My plan was to keep the existing cabinets but add new hardware and also wood to create a shaker style, add a new countertop, add a backsplash, new mirrors, lights if possible, fresh paint, and wood ledge to place items on. I also had some ideas for how to deal with the hand soap since the wall ones wouldn’t work for this type of set up. 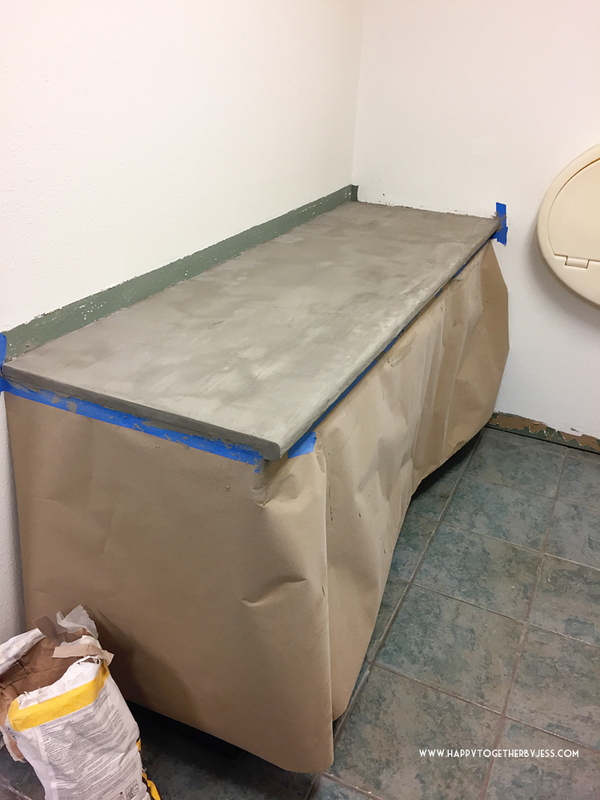 As you can see below, I did end up changing one thing on my original plan: instead of wood countertops I did a faux concrete on top of what was there. It made it so nothing had to be removed and saved a lot of time and money. The very first thing an amazing group of volunteers did was paint the walls in Sherwin Williams Alabaster (SW 7008). 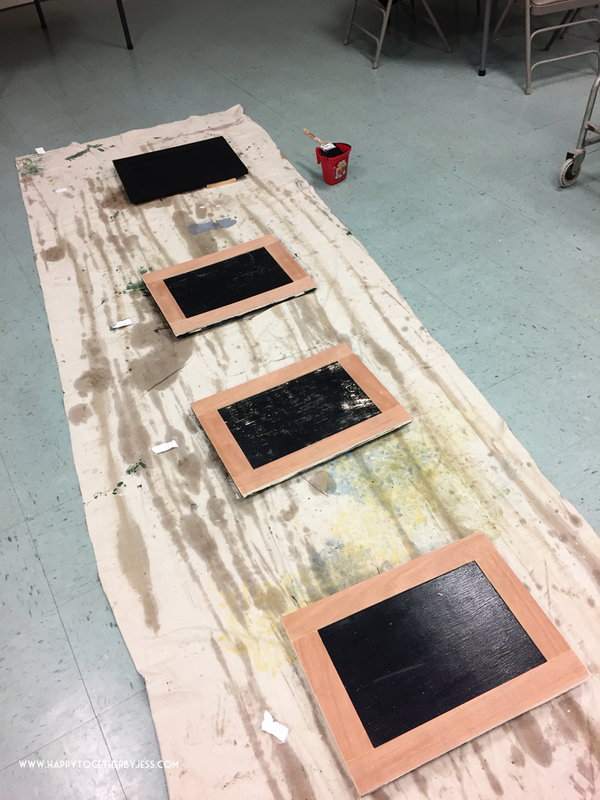 Then the very first thing I did was buy some 2’x2′ and 2’x4′ lauan plywood boards and rip them down to 2.5″ strips. Then I lightly sanded the doors and used wood glue and my nail gun to put them in place. I used wood filler on the nail holes and in any seams that had a gap. Then I caulked around the edges where the wood met the doors because the doors were curved on the edges. This just helped fill in that space. Not a necessity, but I thought it made it look a little more finished. Then came all the painting! If you are doing a lot of doors, make sure to mark which ones go where so when you go to put them back on it doesn’t take forever. 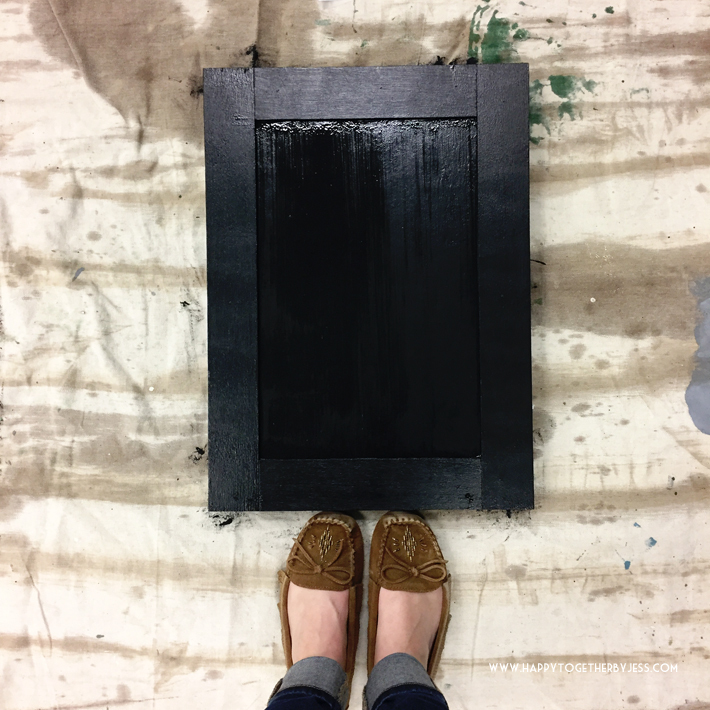 We used an enamel paint in Sherwin Williams color Black Magic (SW 6991). I had a lot of helpers with painting these, as I do not have a sprayer. I found this tutorial useful for getting a nice finish even though we used a brush and roller. I also added some trim to the side of the cabinets to continue that Shaker cabinet look. The hardware added a lot to the cabinets! The top “drawers” are not really drawers, but adding the pulls (we used these) makes it look so finished. 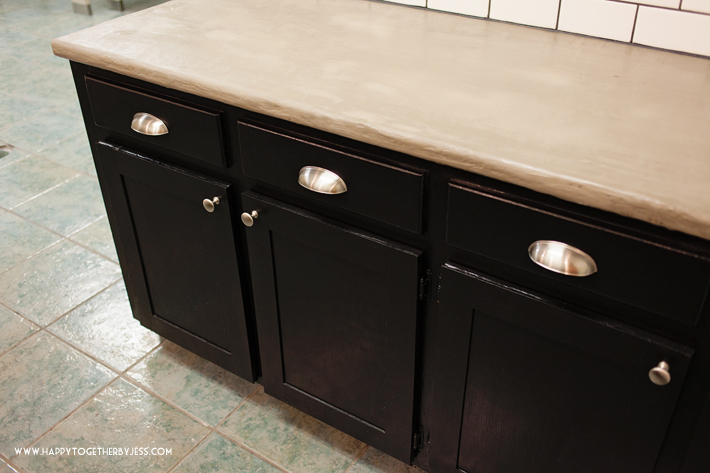 New knobs (here) on the doors also helped update the look and they all matched the sink faucets. My sweet friends installed all of these for me while I worked on the backsplash. It was such a big help! 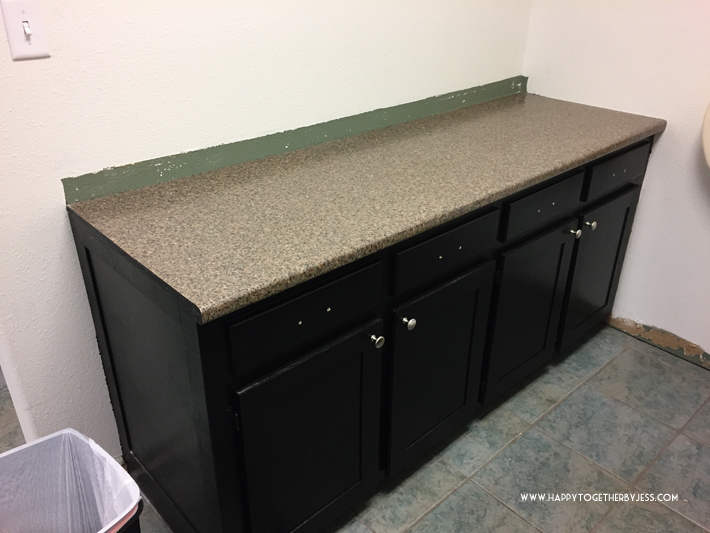 The countertop transformation took a total of three days, but I felt it was easier and more cost effective than the wood option. I read so many tutorials and went for it. It took three coats to get it all covered and I’m happy with how it turned out. The picture below is after the first coat. After the faux concrete was all dried and sealed I went to work on the backsplash. 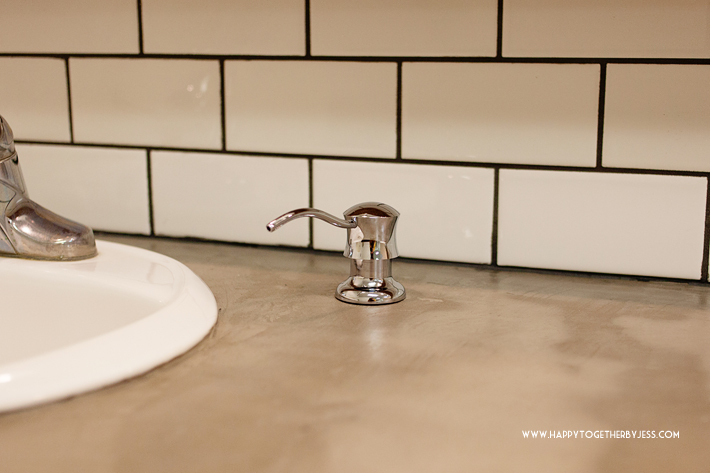 I used these inexpensive subway tiles and this grout. 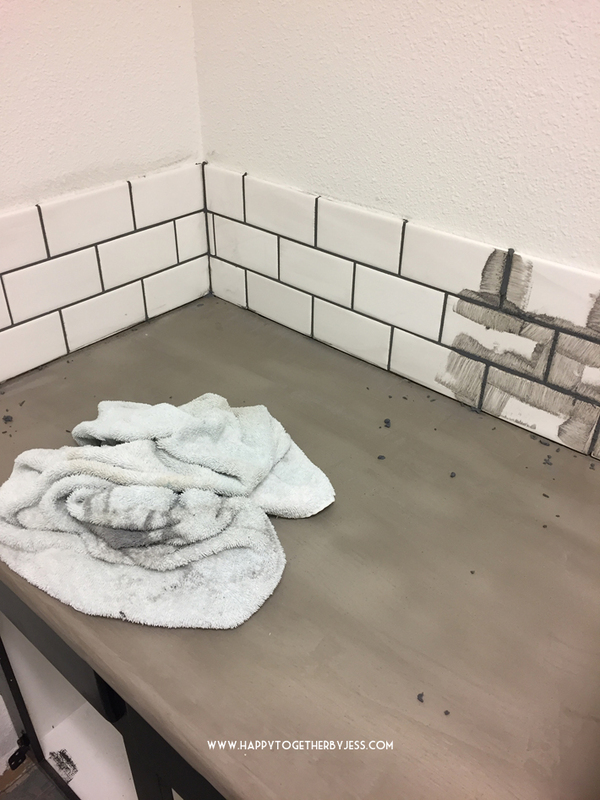 It was my first time working with a dark grout and I found that this stuff is messy! lol But it looks beautiful. I just suggest doing smaller sections to make cleaning easier. It seemed to dry faster to me. When all of that was finally done, I added this pretty wood ledge. It is a 2″x4″x10′ with a 1″x4″x10′ piece behind it. 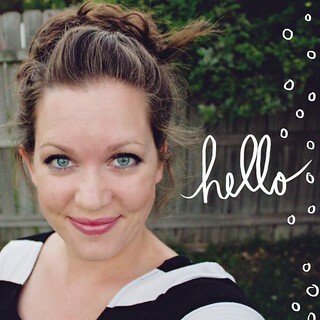 I screwed the 1″x4″ to the 2″x4″ first and then used liquid nails and a nail gun to keep it in place on the wall. Oh, and I stained it with Minwax Early American and sealed with three layers of polycrylic semi gloss before putting it on the wall. For the soap, we decided to go with soap pumps by the sink. It really takes the look up a notch and I totally did this hack where you add the hose underneath to connect to a large bottle of soap versus the small bottle that comes with these. This is the soap pump and the hose we used. They are working great so far. 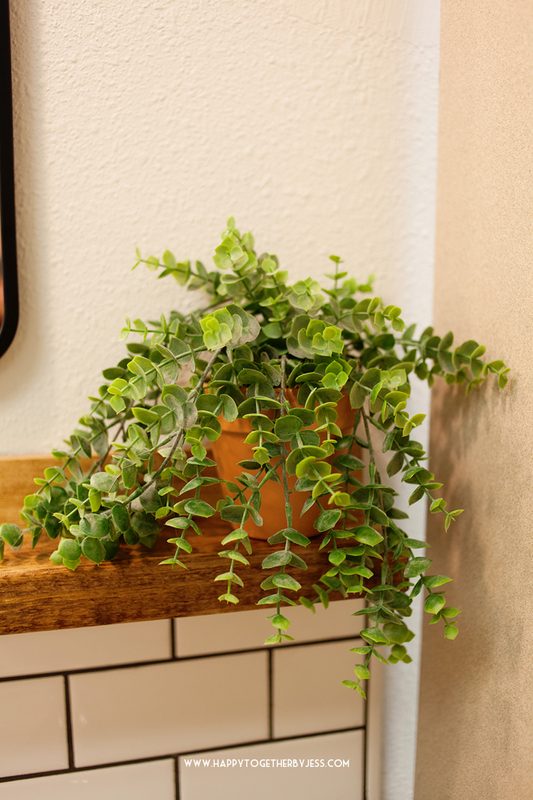 The greenery all came from Hobby Lobby and I put one of the plants in a clay pot. I found a clear vase in the back for the fern plant. 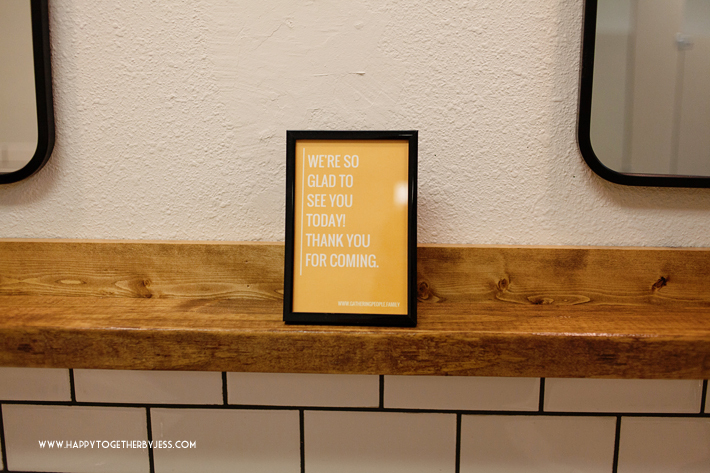 I also added two 4″x6″ pictures frames so they can put in announcements or holiday themed printables, etc. 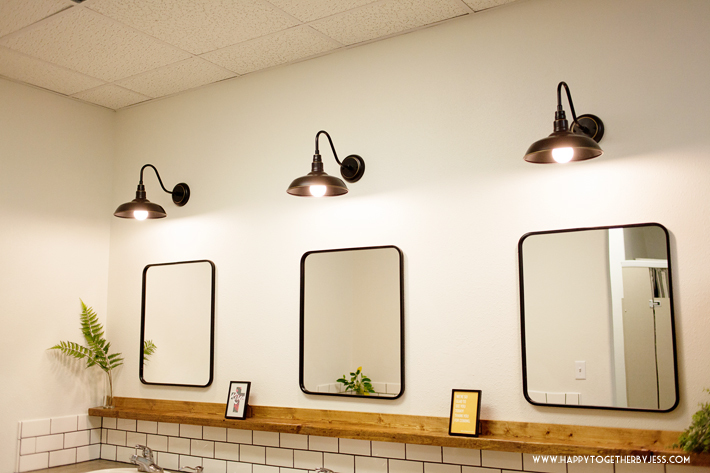 Lastly, the awesome electricians were able to wire in these lights (which if you wait for a sale, they have gotten as low as just over $30/each!) for us and the mirrors are from Target. 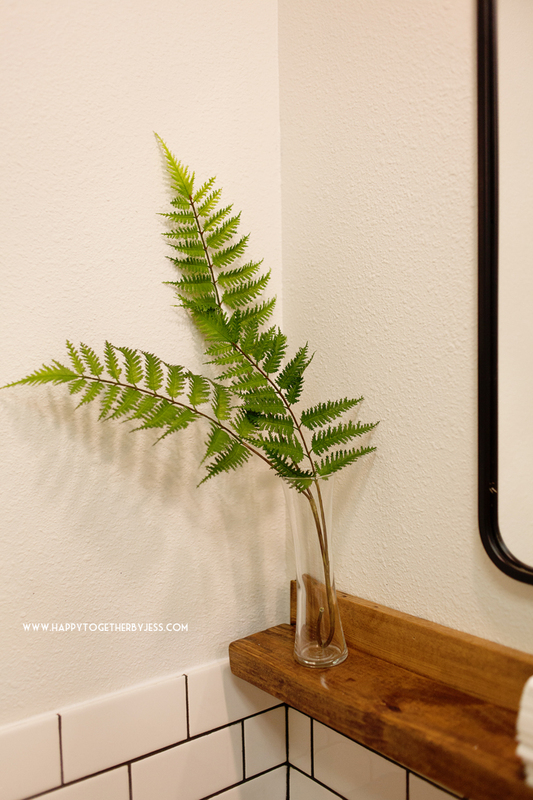 They are the most cost effective for this type of metal mirror I have found, and I scoured the internet a long time! 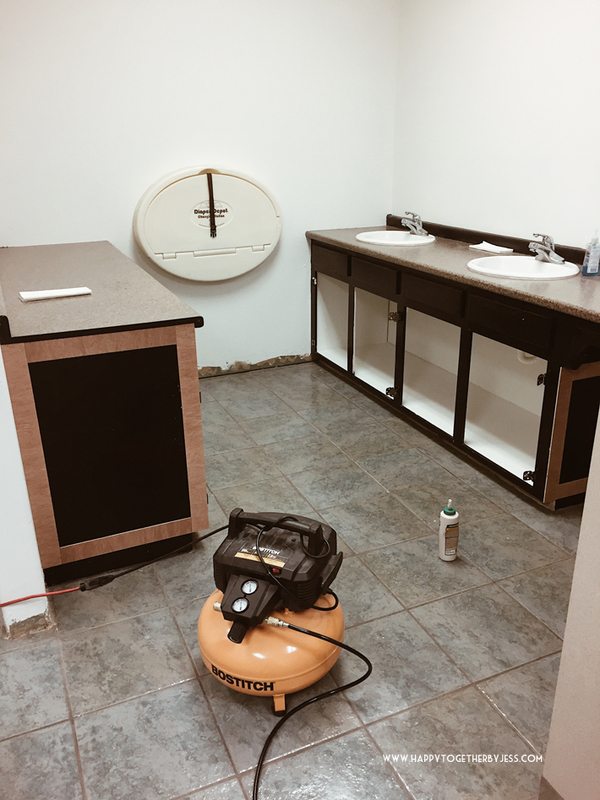 I am not sure when the flooring and baseboards will be done, but I wanted to go ahead and share this part of it. When that part is done, I will share a final reveal. 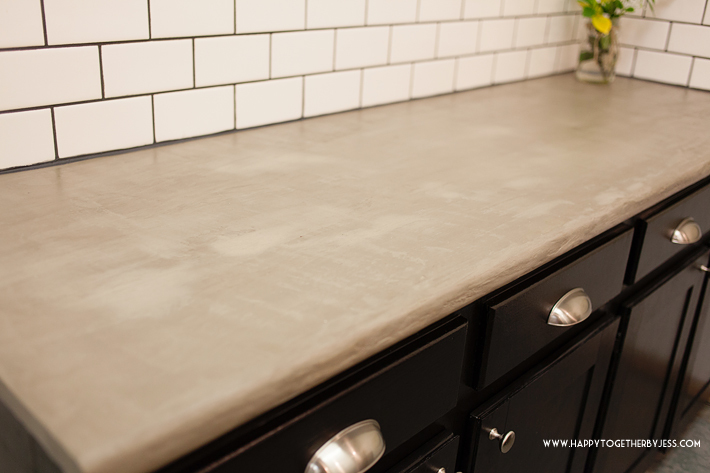 I also plan to do a more in depth post next on my experience with the faux concrete countertops, so be on the lookout for that if you are interested. 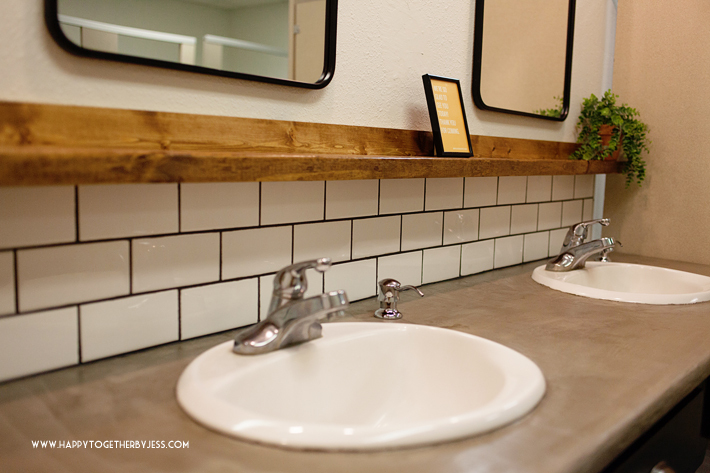 And always remember, a little change can go a long way in making a simple bathroom makeover. I believe that children are the most amazing artists. They are just so creative and their imaginations run so wild and free! I am amazed almost daily by things that my daughter does artistically. I tell you, she’s a much better drawer than me already! She likes to take leftover boxes and such and color on them/put stickers on them/cut them up. I had finished putting our Christmas cards together this one time and she asked for the box. 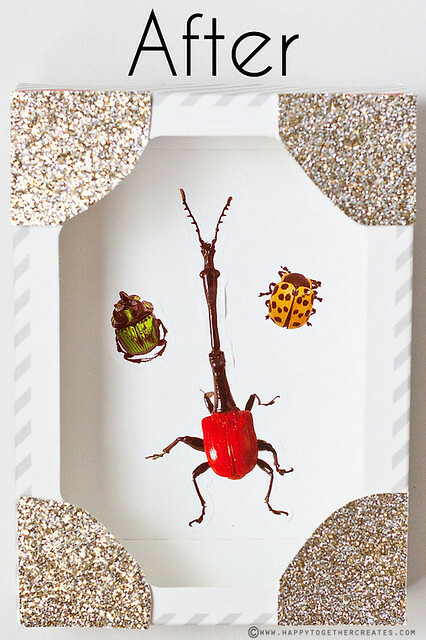 I gladly gave it to her and she brought it back to me decorated with bug stickers. I thought that it looked really pretty. 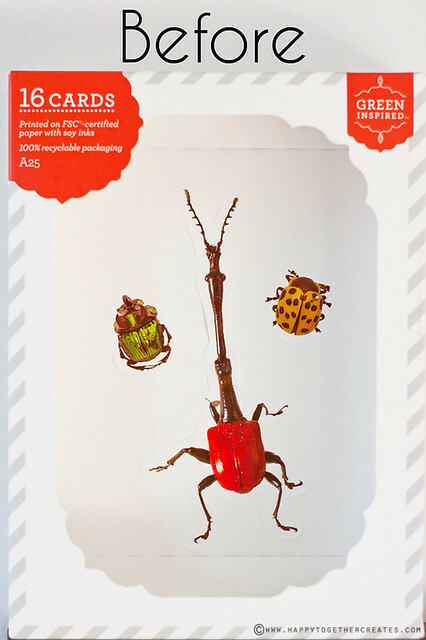 She had arranged the bug stickers so well and the colors were so bright and perfect together. I decided that it needed to become a piece of wall art in her room (I’m hoping to redo it again soon with nature being a big part of it). But it had the card information on the box. So I grabbed some glittered scrapbook paper and cut out pieces to go on each corner and cover up the advertising. We glued them on and added a hanging bracket on the back. Now it’s just right.